01/27/18 Updated What's New page. Redoing my website. 01/27/14 New video added to the Videos Page 1 - the audio with words for the 1971 The Merv Griffin Show that Pete and Ben were on! 09/07/13 New formatting for links. New music videos added to Videos page! More Vidcaps added to the Vidcaps page! 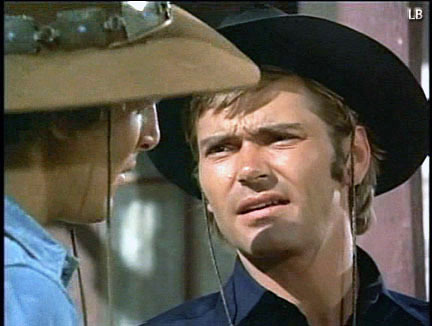 New Fan Piction photos added, and Pete Duel Page with Collages pages! 07/09/12 Website moved to new address. New music videos added to Videos page! More Vidcaps added to the Vidcaps page! New signs added to Pete Graphic Design Work, AS&J Graphic Design Work, and Pete Duel Page with Collages pages! 12/30/10 I made a new music video to remember Pete Duel, and I played the music in it. It's on the Home page and the Video page. 12/17/10 I added two Heyes Snowglobes to the Pete Duel Page with Collages, and one with Heyes and Kid to the Home Page. 12/02/10 Two more pictures added to Page 3 of Fan Piction. 11/24/10 I added another Thanksgiving sign to the home page. I redid the Fan Piction photo of myself with Heyes singing to me. I've added more vidcaps for Exit from Wickenburg. 11/17/10 Last night I added 3 more pages of vidcaps for "The Man Who Murdered Himself" and the last 3 pages of vidcaps for "The McCreedy Bust" on my Vidcaps page! I moved my Chritmas Comic and the holiday-type videos to the top of my "Videos" page and also put some on the Home page! 11/11/10 All the vidcaps are up on the Vidcaps page! I added new vidcaps for "The Girl in Boxcar #3," and I reformatted the Home and Links pages. I also added a new page "Pics with the Actors" that has photos of actors from the show I've met. 11/07/10 Fan Piction pages added to the Pete Graphic Design Work area. 11/07/10 New pages added: AS&J Graphic Design and Links. Pete Videos and Slideshows is now AS&J Videos. Home page redesigned. 10/29/10 Halloween Video added. Always Remembering You, Pete... changed to My Pete Pages Home, and changes made to those pages. 11/22/09 Added new funny music video, "What Do Heyes and the Kid Think About?" 09/16/09 Added 2 new pages of vidcaps for "The McCreedy Bust: Going Going Gone! 09/130/09 More vidcaps added: "The McCreedy Bust: Going Going Gone! ", "The Girl in Boxcar #3", "The Great Shell Game", "Return to Devil's Hole", "The Man Who Broke the Bank at Red Gap", "Everything Else You Can Steal". I enhanced all the vidcaps for "How To Rob A Bank In One Hard Lesson" and put them up. 09/14/09 Vidcaps added for: "The Pilot", "Exit from Wickenburg", "The Fifth Victim", "Wrong Train to Brimstone", "The Day They Hanged Kid Curry", "Six Strangers at Apache Springs", "Night of the Red Dog", "Dreadful Sorry, Clementine", Shootout at Diablo Station", The Bounty Hunter", Miracle at Santa Marta", "21 Days to Tenstrike", and "The Men That Corrupted Hadleyburg". 09/14/09 All the "Vidcaps" are being moved to Fortunecity, and have been moved to different pages. The "Fun N Games" pages are up and running! I'm working on adding more vidcaps.